As a Founding Father and signer of the Declaration of Independence, Dr. Benjamin Rush was close friends to both John Adams and Thomas Jefferson. 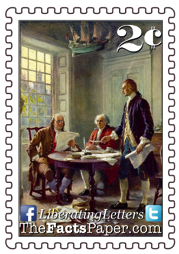 He was there when the two men worked together to carefully and diligently compose the Declaration. Rush understood how much these two men contributed to the founding of this country. Which is why it devastated him so when his two friends became archenemies. Shortly after America won her independence from King George III, America’s ally began her own revolution. While many Americans supported France’s fight for their own freedom from their crown, others were dismayed by the violent and bloody way in which they were pursuing it. (see Storming The Bastille and Reign Of Terror) Among those at odds were Adams and Jefferson. The disagreement led to the two men running against each other upon President George Washington’s announcement of declining a third term. (see The Man Who Refused To Be King). When Washington’s first term was up, both the Federalists and the Democratic-Republicans nominated Washington for president, with only their vice-presidential choices differing. (see Washington’s Liberating Letter). It was the last time competing parties were ever so united in America. With Washington stepping down, the Federalists nominated Vice-President Adams while the Democratic-Republicans nominated Jefferson for President. New vice-presidential candidates were also nominated, but the Constitution awarded the position to whoever garnered the second highest number of votes. Underhanded scheming by Alexander Hamilton to deny Adams the presidency not only backfired, it gave Jefferson the vice-presidency. Therefore competing parties, led by two men adamantly opposed to each other, held the two highest offices in the country. Friction only continued to mount over the next four years, which resulted in an even more heated and vicious election in 1800, to which Jefferson emerged as victor. Shortly after, Rush sent a similar letter off to Jefferson in hopes to reunite his two dear friends. Both men were receptive, and upon reflection, Jefferson sent a letter to Adams which was well received and reciprocated. Before long, the two rivals, who were now in their golden years, participated in frequent correspondence of friendly letters of camaraderie, reflection and insight that lasted for almost two decades. No one will ever know if Rush’s dream was truly a premonition, or if Rush’s sharing of the dream was the cause of Adams and Jefferson’s reconciliation. Regardless, it was a blessing for the country then and now. That being said, many of the remarks in the letter did come true. The men not only renewed their friendship, it deepened over the next seventeen years as their letters filled entire volumes of books. The “world was favored with a sight of the letters,” as they were later published for all to read. Rush’s dream noted the men would “sink into the grave nearly at the same time.” Adams and Jefferson both died on July 4, 1826, just three hours apart. The date also marked the 50th Anniversary of the signing of the Declaration of Independence, the document which initiated their friendship in the first place. Liberty, we are living through very similar turmoil that tore John Adams and Thomas Jefferson apart. Democrats and Republicans are both digging their heels in and not reaching out in unity to their fellow countrymen. We are seeing football players take a knee and continuing to protest for their cause, while willfully alienating their own fans who they wish to reach. They have the right to protest and voice their beliefs, but the means that they have chosen is insulting a good portion of their fans. Their particular protest is not bringing unity or encouraging a dialogue, rather it is fostering resentment and anger. They ignored their fans’ complaints of disrespect, but cried foul when Vice-President Mike Pence walked out of a game following their kneeling protest, failing on all levels to see the irony and hypocrisy in their disproval. In other words, they believe their protests must be accepted regardless of how it offends, but to disrespect them by protesting their actions is beyond offensive. This conveys they think only their point of view is valid and should be allowed. Likewise, late night talk show host Jimmy Kimmel has recently gone on several political tirades regarding healthcare and gun control. However, when Hollywood bigwig Harry Weinstein‘s sexual assault allegations surfaced, Kimmel was eerily silent, claiming he is not the “country’s moral compass“. When asked if bothered that Republican viewers were turning him off, he replied, “if they’re so turned off by my opinion...I probably wouldn’t want to have a conversation with them anyway.” This, Liberty, is the crux of the problem. Everybody wants their own opinion and believes everyone should listen to that opinion, but they don’t want to hear anybody else’s opinion. Opposing points of view are natural and necessary in a democratic republic. Even Rush had disagreements. He sowed the seeds of discord with General George Washington during the Revolutionary War, condemning Washington’s leadership and management over the army hospitals in a letter to Patrick Henry. As a result, he subsequently lost his position as Surgeon General. However, time and wisdom allowed him to see the importance of both sides needing to come together, leading him to truly regret his remarks. America again is in desperate need of a Benjamin Rush to reach out to both sides and encourage unity. Glenn Beck has been trying to do just that, promoting the loving, peaceful, and forgiving actions of Jesus, Martin Luther King Jr. (see Free At Last? ), Dietrich Bonhoeffer (see Holocaust: Then And Now), and Gandhi. However, the left has so successfully damaged his reputation in their attempts to destroy the opposition, many mirror Jimmy Kimmel and just aren’t listening to him either. He has reached out to several of those on the “other side”, some of which reciprocated in kind. However, they were quickly ridiculed by those like Kimmel, disgusted that one of their own would give the “enemy” the time of day. God has sent us letters over the years that, at least for a moment, brought us together. Unfortunately we only seem to listen to the ones delivered through hardships. One the other hand, those are the events that allow us to show the most compassion to our neighbors. The terrorist attack on September 11, 2001, (see Never Forget) stopped the incessant arguing over voter chads in Florida during the George Bush vs. Al Gore election, and allowed the county to unite as one. Most recently, we saw Americans come together to help victims of Hurricane Harvey in Houston, Texas, Hurricane Irene in Florida (see Weathering The Storm), the massacre in Las Vegas, Nevada, and the wildfires in California. While political pundits and agenda driven elitists continue to blame the other side for these events, real Americans have rolled up their sleeves, donating their time and/or money, and helped their fellow citizens because it was the right thing to do. It would be great if a Dr. Benjamin Rush could somehow reunite the leaders of our country, but I believe the true leaders are the ones in the trenches already mending the fences, figuratively and literally. If We The People can continue our focus on that dream, then America may just find her way out of this nightmare yet.